One of the interesting things with the Master System is seeing how well it can cope with significantly more advanced games than the hardware can typically handle. 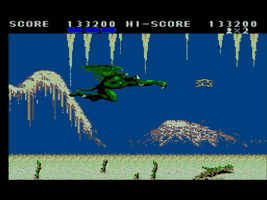 Despite an obvious decrease in graphical fidelity, certain games manage to offer authentic arcade experiences that are still immensely enjoyable to play. 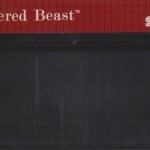 Altered Beast isn’t one of them. 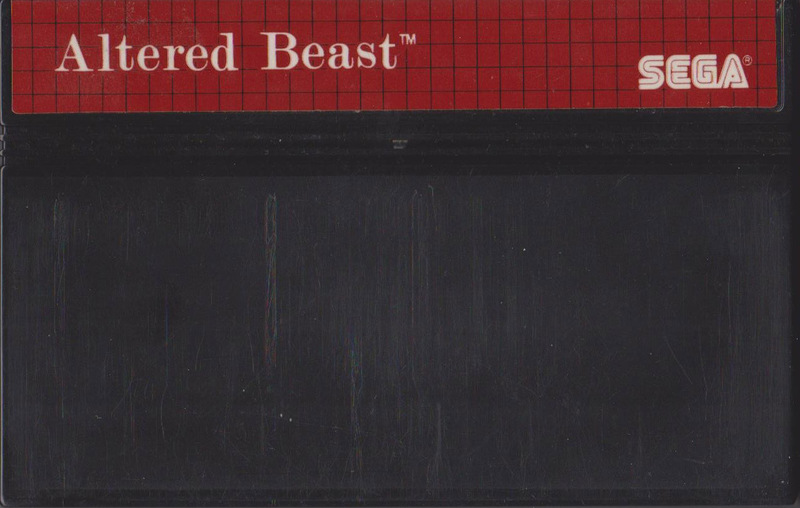 Altered Beast was never anything special and despite some pretty special effects like the famous beast transformations, the game is pretty much a dull scrolling action game where you slowly moved from left to right whilst punching or kicking anything that moves. 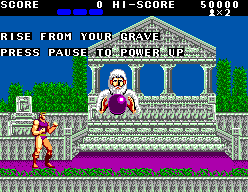 The Master System versions clearly understands this and despite changing the amount of power orbs you need to transform into beast mode from 3 to 2 and scrapping the stage with the bear transformation, the game plays out exactly like the original. 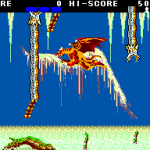 The main difference is just how hampered the experience is on the Master System. 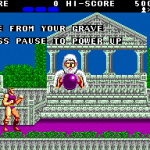 With only two buttons at your disposal, you have to press 1 to punch, 2 to kick and then 1 and 2 at the same time to jump which is not the optimal way to play the game. It just feels awkward and if you don’t make sure you hit both buttons you’ll end up attacking instead which is incredibly frustrating if you’re jumping to avoid enemies. 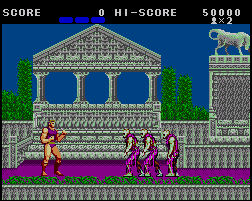 As we’ve already mentioned Altered Beast obviously doesn’t compare graphically to its arcade or Mega Drive brethren but what is going on with this horribly stunted scrolling and animation? 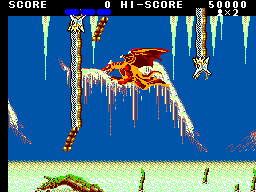 The game staggers its scrolling effect into horrible little movements which mean the screen feels like it’s uncomfortably jerking forward instead of smoothly scrolling like the majority of Master System games manage with no trouble whatsoever. The movement of the characters also suffers from the same problem and it’s a really bizarre design choice that just makes the game look ugly and clunky. 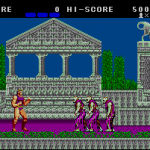 Altered Beast on Master System could have offered a nicely scaled down version of the arcade original and the console has more than enough power to handle a game as simple as Altered Beast. 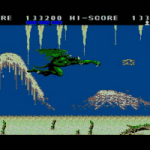 Unfortunately by assigning the jump button to two buttons and ruining the smooth scrolling of the original, this is simply a slow and pretty dull romp through an ugly game world that will probably end up with around 5 minutes of play in the average household before it’s put on the shelf and left to rot. Don’t bother rising from your grave buddy, it’s no better up here then it is down there.